Inspired by one professor's infectious enthusiasm for Emily Dickinson, Obsessed is a new HuffPost Culture series exploring the idiosyncratic, all-consuming passions of public figures and unknowns alike. Through a mix of blogs and interviews, these pieces will highlight the elusiveness of whatever it is you just can't live without -- whether it's blue jays, Renaissance fairs, fan fiction, or in the case of David Lynch, coffee. If you have an obsession to share, drop us a line at culture@huffingtonpost.com. Mike is a man of few words. He rations them and speaks slowly, so in the time it takes to serve up a sentence, the listener has grown ravenous. His voice has provided the very steady narrative of my life -- but when he talks about Lewis and Clark, something changes, ever so subtly. You see, two men who got a few pages in the history books have shaped many chapters in my father's tale. My father didn't have any real collections or hobbies as a kid. He can't recall squirreling away baseball cards or coins, but he does remember reading about the Lewis and Clark expedition in elementary school. The journey wasn't covered in much depth, but a seed of curiosity was planted. Their 1804 adventure was "something that was in the back of my mind for many decades," he realized as we spoke. It would be romantic to say that years later he stumbled upon a book about his long-lost pals, but everything my dad does is deliberate. He's a man who wastes nothing: food, words, movement. At age 40 he sought out "The Journals of Lewis and Clark," edited by famed professor Bernard DeVoto. "It wasn't so much that they were good writers," Mike explained. "I liken it to someone walking on the moon for the first time. They were walking into areas, especially when they crossed the Rockies, that no white man had ever seen or written about before. It was a real adventure story." Dad hasn't had many adventures himself, unless you count surviving a suburban life in a house with three women. Still, he remembers the childhood joy of overnight hikes at summer camp. He can still conjure up the scent of balsam in the forest, and the feeling of being self-contained for a few days. "I think I like to live vicariously through them," he says. "They saw the whole Northwest and up the Missouri in its pristine state. They saw a herd of buffalo a mile square. Can you imagine that? Can you hear that huge noise? They saw waterfalls that are gone because those rivers are dammed up. They saw things that no longer exist." Then, my dad's own Sacajawea, my mom, guided him to the ultimate prize. We've always called them "the expensive books," but their actual title is a little longer: The History of the Expedition Under the Command of Captains Lewis and Clark to the Source of the Missouri Thence Across the Rocky Mountains and Down the River Columbia to the Pacific Ocean Performed During the Years 1804 -5-6 by Order of the Government of the United States. Really rolls off the tongue, doesn't it? It's a summary of the Lewis and Clark trip written in 1814, and save for the actual journals, it's the most valuable book about the men. "It was a really freak find," my dad explains. "Mom just went to a used bookstore warehouse, asked if they had anything about Lewis & Clark, and the fellow had these in the back room. I was shocked. It's a tremendous rarity. They're usually only found in private collections." Only 1,400 exist, and Dad owned one. He paid $600 in 1997 and now they're worth about $7,000. If they had the map Clark created ("the most valuable map in all of Americana"), they'd be worth tens of thousands. There are few other books written about the expedition. Dad poked around at antiquarian book fairs, but no other work boasted comparable value. Since the big purchase, they've been resting comfortably in a safe. Save for the first time he leafed gingerly through each volume to make sure they were complete, he hasn't opened them. We all still have PTSD from the day my mom had them rebound. Fortunately, a well-respected bookbinder did a superior job ensuring their value was not diminished. (Mom insisted I add that.) Soon, we began to tease that if dad continued down this pricey path of expensive collectables, we'd be the best-read family in the poor house. "You won't explore your way into my college fund, will you?" I was joking of course ... for the most part. The actual journals are priceless, and a few of the seven lived at the American Philosophical Society in Philadelphia in 1999. The day my Dad and sister went there to see if any were displayed, another "freak" thing happened. A very important donor was prowling the room, so a docent actually brought a journal out of the safe. With white gloves on, he turned a few brittle pages. My father and sister saw something that few people ever have or will. I imagine time stood still for just a moment. Now, there's really nothing more for him to collect. He has all the government-issued coins and stamps, and of course the ultimate book. Owning a journal is unfathomable and impossible. But that's OK. His adoration for Lewis and Clark is not proven by what's in a vault. Rather, he has lived that love for as long as I can remember. "They had the privilege of seeing nature in its most pristine form. I wanted to show you girls natural beauty too," he said. And so Lewis and Clark helped shape a man who brought my sister and me down forest paths and up into mountains. During the 2003 blackout, when everyone was panicking, we drove to a dock to see the stars and listen to... nothing. Lewis and Clark will never know that their journey inspired one man to show his daughters the natural majesty hidden behind a land of malls. But I know. And now you do, too. 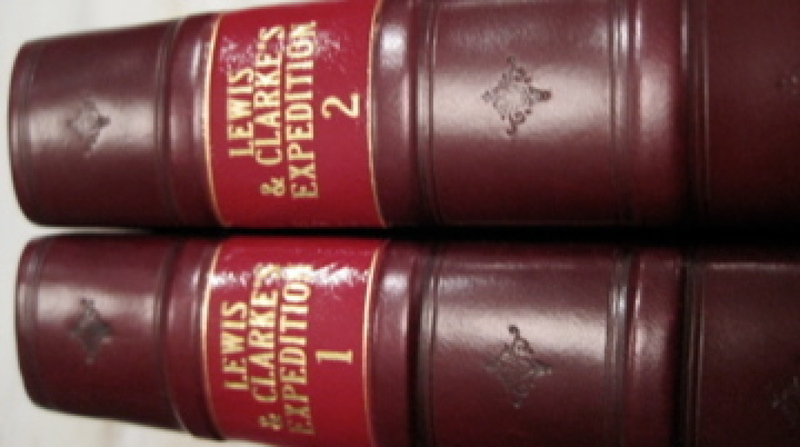 The volumes have a catchy title: "The History of the Expedition Under the Command of Capitans Lewis and Clark to the Source of the Missouri Thence Across the Rocky Mountains and Down the River Columbia to the Pacific Ocean Performed During the Years 1804 -5-6 by Oder of the Government of the United States.' Though they say 'prepared for the press by Paul Allen Esq., Nicholas Biddle did about 95% of the work before Paul took over. Mike bought them for $600, and today they're worth about $7,000. If they had one of Clark's maps inside, they would be tens of thousands more.